Camping, fishing, hunting, boating, and hiking are just the beginning of the activities available in the parks and other public lands of Benbrook Lake. Use the navigation menu on the left to see all the great information on the site, or scroll down for important current information. General information about the lake can be found by clicking here. The 'bubblers' near the dam are at this time the responsibility of the Tarrant Regional Water District, the agency that installed them originally. Please call TRWD at 817-626-2888 with any questions. Spring Turkey Hunting Applications are now available. See our Hunting Page for more information. America the Beautiful Passes are not issued directly from the Benbrook Lake Office: they are available at the entrance gatehouse at South Holiday Campground. USACE Annual Passes are available in all parks. Like us on Facebook. Click for link. 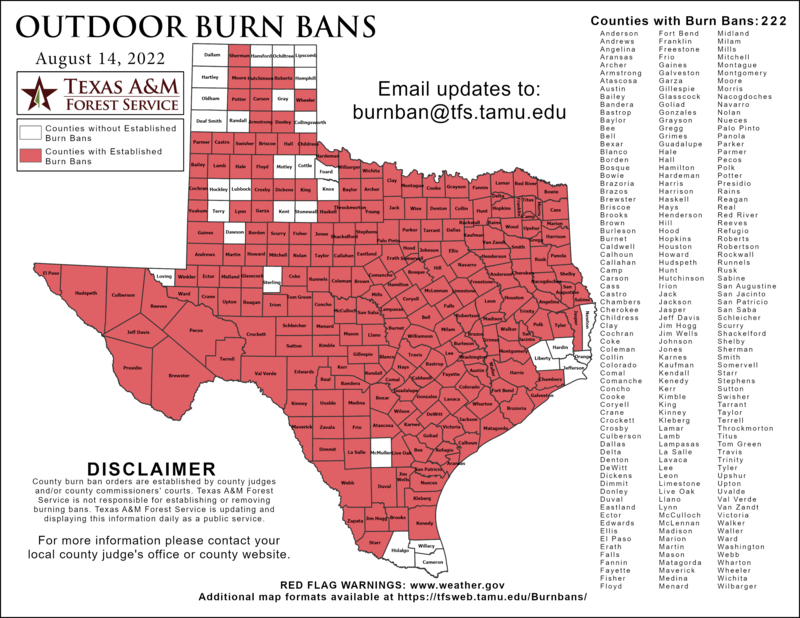 During any burn ban for Tarrant County, set by the County Fire Marshal, open fires are not allowed in cookers and firerings. Charcoal and gas grills may be used, but only if they can be immediately covered to extinguish the fire. Current Burn Ban information can be found at here. According to the Texas Transportation Code, Golf Carts are not allowed to be operated on Public Roadways at Corps of Engineers Projects. Horse trail from South Holiday Campground to Benbrook Stables is open. All other trails are are closed due to flooding and wet conditions. BENBROOK LAKE HOLIDAY CAMPGROUND PARTIALLY CLOSED FLOOD PARK 12/11/2018 12:52:14 PM Several sites remain closed for repairs. Boatramps are now open. Courtesy Dock and Fishing Pier are closed. BENBROOK LAKE MUSTANG - BEAR CREEK CAMPGROUND FULLY CLOSED SEASONAL PARK 10/1/2018 9:20:20 AM Bear Creek Park is now closed for the season. It will re-open on April 1. BENBROOK LAKE MUSTANG - MUSTANG POINT MULTIUSE AREA PARTIALLY CLOSED SEASONAL PARK 3/28/2019 2:20:54 PM Swim beach is closed for the season. BENBROOK LAKE ROCKY CREEK FULLY CLOSED SEASONAL PARK 10/1/2018 9:21:13 AM Rocky Creek Park is closed for the season. Day users may access the park on foot. Park will re-open April 1.